In the vast, never-ending landscape of superhero movies, Captain America falls somewhere in the middle. It leans on the side of the greats (Superman: The Movie, Spider-Man 2) instead of the not-so-greats (Green Lantern, Catwoman), but it doesn’t exactly put you on the edge of your seat. It’s a perfectly standard and serviceable adaptation of the 1940s comic book by Joe Simon and Jack Kirby, and if that’s enough for you, you’re in luck. In this throwback adventure story set in 1942, men all over America are gearing up to fight Nazis by enlisting in the armed services during World War II. No one is more dedicated or geared up than Steve Rogers (Chris Evans, with his head digitally inserted on a small body), who’s heavy on courage and heart but light on brawns. Every one of his applications to become a soldier is rejected because he’s too small and asthmatic. Still, he won’t give up and tells his friend James (Sebastian Stan) to wait for him on the front lines in Europe. Impressed by the young man’s spirit and nobility, German doctor Abraham Erskine (Stanley Tucci) offers Rogers the chance to lead a new brand of super soldiers because “a weak man knows the value of strength.” In a secret laboratory fronting as an antique shop in Brooklyn, Rogers is injected with a special serum that amplifies his better (and worse) qualities. Naturally, it works mostly in his favor and transforms him from a short, 90-pound weakling into a sporting hunk with big pecks. 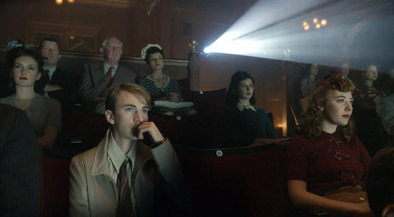 The procedure astounds the military officers overseeing the project, including SSR Officer Peggy Carter (Hayley Atwell), whose view of Rogers gradually shifts from objective war experiment to romantic interest. Colonel Chester Philips (Tommy Lee Jones) still has his doubts, especially when Rogers is turned into a marketing commodity by the war department. Coined “Captain America,” Rogers tours the country in a traveling stage show with long-legged women that urge people to buy war bonds. Although happy to help with the war effort, Rogers longs to be more than just a spokesman. While entertaining troops near Austria, he takes it upon himself to free a band of POWs and proves he can live up to the super soldier title. Soon enough, he’s fighting Nazis all over Europe.